There’s a non-cellular version for $329, too. Just a year after the Apple Watch Series 2 was launched onto an unsuspecting public, Apple has updated its iconic timepiece once again. The Apple Watch Series 3 shares a similar case to its forebear, but most crucially, comes with an optional built-in LTE radio. That means that users can now make calls to their friends without the use of their smartphone, letting you finally live all of those Babylon 5 fantasies. Built-in LTE and UMTS connectivity is the headline feature, which enables both calls and the ability to stream music directly from Apple Music. In addition, the internals are now faster, thanks to a new dual-core chip and other refinements to the overall system. Other improvements include a new barometric altimeter that'll help the device track the number of steps and hills you conquer each day. With "mixed use," you're still expected to wrangle the usual 18 hours of life from the device. Given that the company made the point that the battery life was unchanged, we can expect GPS performance to remain the same, too. Apple has clearly doubled-down on the health and fitness tracking aspects of its latest timepiece, will Jeff Williams showing off improved heart-rate tracking. Now, the watch will surface your current heart-rate whenever you raise your wrist to check the time, and the device will also constantly calculate your base HR. In addition, the company will spend time looking to develop a way for the watch to detect the subtle, hard-to-diagnose symptoms of atrial fibrillation before they strike. Fitbit, a major rival in the wearables space, has promised to do similar to support a future update to its own new device. If you're a fan of subtle hardware tricks, you'll be delighted to learn that Apple managed to keep the case the same size by building the antenna into the display. In addition, the company promises that its new W2 chip will ensure low-power WiFi and Bluetooth connections are handled seamlessly. The W2 name is likely to indicate a successor to the W1, the custom-designed wireless chip that was found inside Apple's AirPods. In terms of surprises, much of the Apple Watch launch was spoiled by a leak of iOS 11 that showed off many of Apple's cards. A screenshot from the Watch companion app showed a device with a black case and red digital crown -- a color feature available on the new bodies. More importantly, however, the face of the preview screen showed off icons denoting both cellular communication and navigation icons. Details of the latter feature weren't touched on during the keynote, but it's possible that the watch now offers standalone turn-by-turn guidance. Since the launch of the first Apple Watch, the wearables industry has changed beyond all recognition, thanks to Apple. The nascent smartwatch world is now dominated by the humble squircle, with independent estimates claiming that Cupertino has sold anything up to 30 million devices. Tim Cook, in his opening remarks, said that the device had grown in sales by 50 percent year-on-year, and now Apple Watch is the world's most popular watch -- although it's probably not the world's biggest watchmaker. The Apple Watch Series 3 will ship with an aluminum case in either Gold, Silver or Space Gray as well as premium ceramic options in White or Black. In addition, the company wanted to crow about its new Sport Loop band -- a cloth, Nato-style smartwatch band that'll handle the elements. 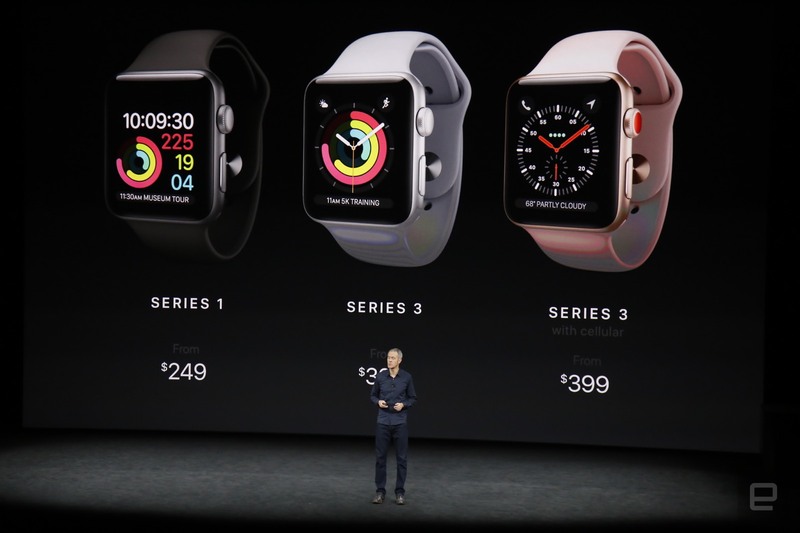 The base model Series 3, which is just called the 3 + GPS, will ship for $329, while the GPS + LTE variant will set you back $399. There are, of course, additional variants for the more fashion-conscious amongst us, including a Nike+ version with a new coaching app. The revamped Nike Run Club will offer audio guided running and coaching from a number of name-brand athletes. Meanwhile, the company's partnership with Hermés will exhibit snazzy band styles and an eye-watering price tag. In terms of cellular plans, the Apple Watch Series 3 will use an e-sim that will use the same number as your smartphone. AT&T has already said that its NumberSync platform will be available on the watch for free, but you'll spend $10 a month to join it to an existing data plan. 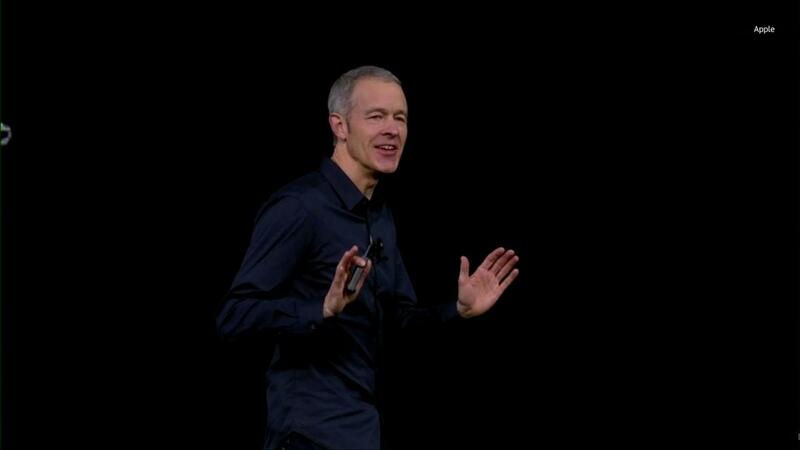 Oh, and Apple is keeping the Series 1 model around as a super-low budget option, with pricing beginning at $249. The Series 3 units, meanwhile, will be available to pre-order from September 15th, with shipping expected to commence on September 22nd.